As of January 2007, the format of the course was changed such that many of the in-lab experiments became on-line exercises where it was found appropriate to do so. Consequently, this course website was "retired" and present-day UW-Madison Microbiology 102 students go to the "Learn@UW" website for course announcements and links to resources (and other useful things including grade summaries). Pages on this splammo.net/bact102 website dealing with the subject matter of bacteriology (theory and practice) are still kept reasonably up to date. Click here to get out of someone else's frames. The lab manual referred to herein is referenced here. This course is required by a number of majors including Medical Technology, Nutrition, Dietetics, the Physician's Assistant Program and Nursing. If you intend to major in Bacteriology, we have Bact. 304 (and the corresponding lecture course, Bact. 303) for which organic chemistry is a prerequisite. Bact. 102 does not have to be taken the same semester as Bact. 101, but please do not sign up for 102 unless you are taking – or have taken – Bact. 101 or an equivalent course. Bacteriology 102 has a lot of substance. It is not a survey course that just celebrates the shapes and colors of the bacterial world. We try to amplify and add to the material given in the lecture course. Likewise, the lecture course serves as a supplement to this course. From time to time, students have been known to "graduate" from this course to a lab technician position out in the "real world." So there are a number of basic concepts which Bact. 102 students and aspiring microbiologists must learn and re-use throughout and possibly beyond this semester. The following items form a major part of the course, and a good understanding of them will be expected when you begin a course for which Bact. 102 is a prerequisite – such as our food microbiology lab course (Bact./Food Science 324). The concept of a single-cell, procaryotic organism: How its structure and activities are all manifested in and about that one microscopic vegetative cell. Give it some nutrients which it can utilize for biosynthesis and energy, and it will duplicate itself repeatedly with the increasing population showing its presence to the naked eye as a colony on a petri dish or a cloudy appearance in a liquid medium. We learn about different types of bacteria, the various kinds of media we can use to "grow" them, how they obtain energy, what they might be doing out in their natural habitats, how some are pathogenic, and how some can be used to produce certain food products for human consumption. No matter how "diverse" these microorganisms are, certain basic life processes will be seen to follow the same plan. We also touch on genetics: how a chance mutation can give an individual organism (and its progeny) an advantage in a difficult environment and also how a cell can change one or more of its characteristics by incorporating DNA from another cell. Much of what we can learn from these single-celled organisms can be applicable to higher forms of life. 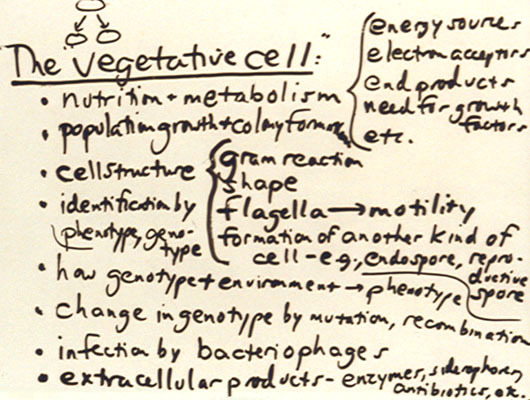 An old "white-board" attempt to summarize what a vegetative cell is all about is shown here. We learn about other kinds of bacterial cells. Under certain conditions, a vegetative cell may divide such that two cells are formed – a vegetative cell and an endospore which develops and matures within the vegetative cell from which it finally escapes. Also, a vegetative cell can give rise to multiple reproductive spores whose main function is to spread the organism around. Endospores and reproductive spores are only formed by vegetative cells of certain genera, and they are indeed complete cells (not mere "structures" as some would teach about them) which are resistant to harsh conditions to a greater or lesser degree. The use of microscopes: We have two kinds – one of which is especially good for observing the shapes and activities of living organisms. Remembering a few basic things each time a microscope is used will bring out the best images quickly and consistently. Bacterial quantitation: How to estimate the density of microorganisms in food, water, soil, and other samples. We have formulas that help, but the basics of "dilution theory" should be simple enough that formulas are not required. Aseptic technique: How not to contaminate yourself or the environment with the culture you are studying, and – often more importantly – how not to contaminate your culture with organisms from yourself or the environment! We will be treating our bacterial cultures as potential pathogens even though most are relatively benign. We should also get an appreciation of how "bad aseptic technique" can delay diagnosis of a bacterial problem and even encourage pathogens further. Proper use of terminology does matter! 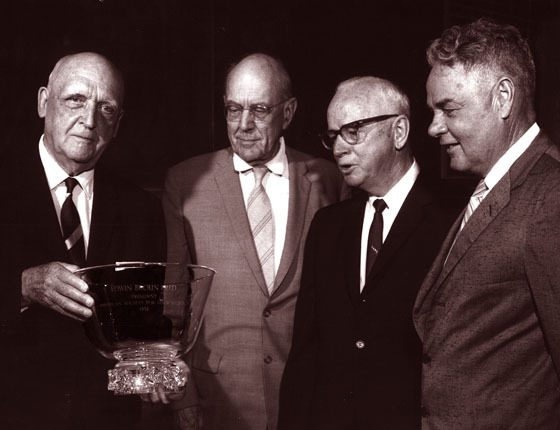 Hopefully you will become comfortable with this field of science, and how you come across discussing bacteriology out in the real world says much for the field and yourself. A general list of topics covered in the course is here. There are really not that many basic principles to understand. However, they work together and build over the course of the semester. You can wind up not only knowing lots of stuff but also how to come up with logical ways of accomplishing things. We do not indulge in the memorization of lots of trivia – i.e., things that can fill up tables in reference books. From time to time we may throw out a "thought question" to test your understanding of basic microbiology, and no mass memorization of minutiae will help in those situations. Keeping up with the material is necessary, and this also applies to the lecture course. Do not leave things until cramming becomes a necessity. Come to lab prepared! You can always consult the lab schedule to see what is coming up and then plan accordingly. Making a "flow chart" ahead of time can help one sail through the lab period with less problem. Keeping a notebook is also necessary. You will need to take good notes of the lab lectures including the material presented on the blackboard. You may find there is no space in the manual to record certain observations, and you will want to make note of certain material which may need your attention before the next lab. You can collect your "flow charts" in your notebook as well. A loose-leaf notebook which can be arranged chronologically or according to experiment number is a suggestion. Such a notebook can also be handy for keeping all of your handouts. If you find you have questions about the material as you come to lab, you and the class can benefit greatly if you bring up these questions during the opening lab lecture. Before lab, you may find one or more of the instructors struggling to get things ready for the lab section, and they are sometimes unavailable until the period begins. Besides the various elements of your lab experience which include note-taking and the use of the manual and handouts – we have our website to help with a good review. A few things may be explained more clearly on the web than in the manual (such as growth curves, dilution theory, oxygen relationships and differential media), and you will find some of the lab demonstrations reproduced in blazing color. This is also the place to find answer keys for certain questions and problems in the manual. This is a fairly easy-going lab and also has been quite safe as long as you remember your "aseptic technique"! Make sure your insurance situation is in order. We do not have a blanket insurance policy for students taking lab courses, but the lab instructor can be held fully accountable for negligence, if that ever happens. As mentioned above and also on the first day of lab, be sure to keep up with the material throughout the semester! You might encounter a lot of "fine print" in the manual and also in the resource material on our websites – i.e., the Bacteriology 102 Website (where you are now) and also our General Microbiology Pages (which are indexed here). To bring some focus to this material, the Update Page (example here) not only (1) reiterates the required assignments announced in lab (for reading and for handing in) but also (2) links to recommended supplementary material on the web (our websites and those of others). Our general microbiology pages have been found to be helpful by others who use the web. For example, do a search with any good search engine for "catabolism" or "dilution plating" and see how our page ranks. So, as you search around the web, let us know if you come upon some particularly useful material, and we will add it to our growing list of links. As you go through the procedures – whether you are reviewing for a quiz or otherwise – ask yourself "what did I do" and "why?" Also: "What did I get out of my results?" A good set of notes from the lab lectures is especially valuable. Keeping up with the lecture course also "greases the wheels" and much of what you learn in 102 can help with 101! The list of lab manual topics found here (bottom half of page – with links) may be of some help as a study guide. Links to the keys showing the answers and solutions to the sample questions and problems in the manual are listed below. Remember that what we have in mind regarding these keys is that you should go through the sample questions and problems first on your own (i.e., quiz yourself! ), and then check your results with the keys. For true/false questions, be sure you know why a given statement may be true(+) or false(O). Answers to the old quiz questions in Appendix X. Check these often as they may help with various non-quiz items from time to time. Answers to the old final exam in Appendix Z. Relevant to the discussion of dilution theory when we get to Experiment 4 are solutions to the first set of practice problems which consists of example no. 2 on page 122 and nos. 1-8 on pages 168-169. Solutions to the second set of practice problems – i.e., those mentioned in Experiments 8.2 (recombination) and 9.1 (phage quantitation): nos. 9, 10 and 11 on pages 170-171. Solutions to the third set of practice problems – i.e., those mentioned in Experiments 15 (water analysis) and 13.1 (S. aureusquantitation): nos. 12 and 13 on page 171. Following is a list of some special sets of questions on our website which are good to think about, as you may encounter similar situations someday. It is probably best to go over these questions after the mid-semester point when they will make more sense; there is no need to worry about them for the first quiz! Presently we don't have keys to these questions on the web. Some general review questions are found here. Throughout this page (especially in Sections III and V) are questions about the enrichment and isolation experiments which we get to in the middle of the semester. Review questions about media are especially good to think about when we get to Experiment 14 and consider formulation of differential media. The ideal grading scheme would be to assess performance in each of several major areas of the laboratory (aseptic technique, bacterial quantitation, correct use of terminology, and other units of basic knowledge) such that no one could get an A for the course if any of these specific areas were found to be deficient, no matter how many overall "points" were attained. While we continue to try to figure something out along these lines as this course evolves (with the "real world" in mind), we have a grading system which is unfortunately based directly on points. We try to weigh each graded item such that individual work is emphasized. Relatively fewer points are given for take-home work and the "unknowns." If a quiz is missed, it must be made up before the corrected quizzes are returned to the class. One or more quizzes may include "practical" questions. At least one of the quizzes will be a "take-home." Use the grading scale on the right as a guide. The final letter grade will not be based on a stricter scale. At any time during the semester, you can easily calculate your current percentage by dividing your accumulated points by the number of points taken by that time (and then multiplying by 100%). A word of caution: Do not base how much you study for any quiz or exam on what your current percentage is or might become. One can never tell how "hard" or "easy" any particular quiz or exam may be. It will be to your advantage to follow the advisory given above in the section on "Study Hints and Answer Keys." There will be no problem taking the final exam at a different time if you find you have other finals piling up together. 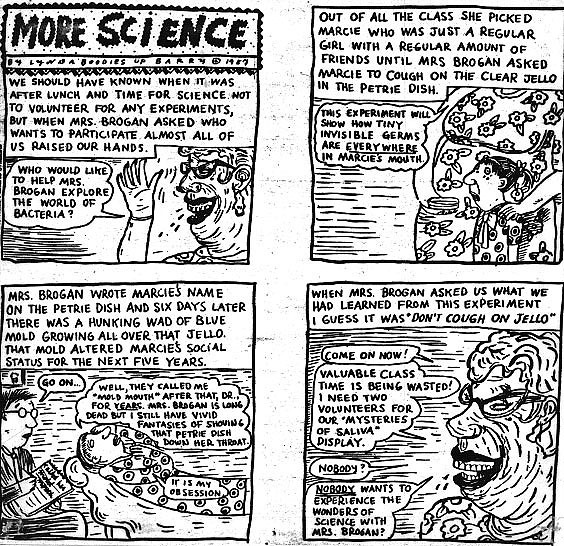 Click on image for the classic Linda Barry cartoon about learning microbiology in school. Oxygen relationships and related things about energy generation. You gotta know this stuff! Bacterial identification: phenotypic and genotypic. Correct usage of terminology including the definition of strain. Microbes.info – The Microbiology Information Portal. Lyme Disease. I've had it, and so can you! A thorough review and discussion of the physiology and microbiology associated with hand-washing can be found here. The Tree of Life Web Project. Be sure to check our site outline. The content of this Bacteriology 102 Site has copyright by John Lindquist and found its permanent sanctuary on www.splammo.net in 2001. Even though this website may be "archived," the pages of reference material are updated as needed. Also see our General Microbiology Pages. The pages on this website may be freely linked to, but they cannot be made part of any other website – .edu or otherwise. See statement (in red) regarding internet piracy here. on 1/24/07 at 11:45 AM, CST.